An old remedy suggests that regularly chewing honeycomb during allergy season will alleviate sneezing, runny nose and watery eyes. Chew the honeycomb for as long as possible; after 30 minutes, allergy symptoms could disappear. 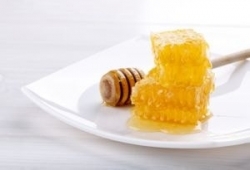 Start chewing honeycomb a week or two before allergy season to keep allergy problems from starting. 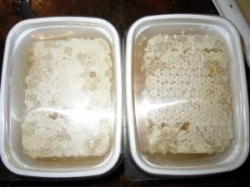 Honey contains potassium, and bacteria cannot survive in honey because of this ingredient. Raw honey straight from the honeycomb is used to treat scarring. It's also popular as a facial moisturizer, a mask and a body scrub. 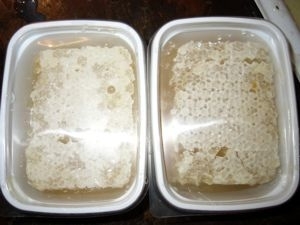 Raw honey from the honeycomb is also used for many skin infections. Honey straight from the honeycomb has all the main amino acids and necessary B, C, D and E vitamins. Honey also packs a punch of powerful and essential enzymes. A big misconception about honey is that it is fattening. Honey can help a person lose weight, as it has properties that boost metabolism and fight fat. Honey, especially raw, unprocessed honey from a honeycomb, is said to have a pronounced effect on a body, because of honey's antibiotic properties. It cleans the blood vessels and aids in digestion. Honey can give a person an instant energy boost. Honey has been used for many years to treat athlete's foot, arthritis pain, yeast infections, hangovers, sore throats, insomnia and as a natural cure for cuts and burns. The purest honey is from the honeycomb. Its ingredients include water, pollen, fructose, glucose, organic acids, proteins and enzymes.